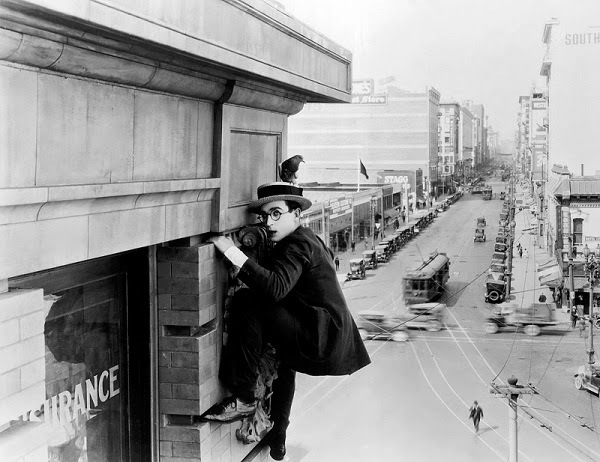 The quintessential Harold Lloyd character is the affable, bespectacled boy next door, anxious to get ahead, not very good at anything, but willing to compensate through sheer energy, bounce, and push; he is the comedic embodiment of the American Dream—what an ordinary man can achieve through a lot of hard work. The filmmaker’s success, as well as that of his characters, is that rare American miracle, the improbable, inspiring accomplishment that couldn’t possibly happen, but did. Safety Last! (1923), Lloyd’s most famous film, tells the story of a small-town young man on the make in the big city, trying to save up enough money so he can marry the woman he loves. Why a story of material betterment and romance should culminate on top of a skyscraper, only Lloyd could tell you. But it is in that juxtaposition of gag and thrill, at the intersection of improbability and idealism, that Lloyd’s specific brand of movie magic transpired. Benefitting from careful plotting, an impeccable sense of timing and tight, functional, unobtrusive editing rhythms, certain sequences of Safety Last!, which follow’s Roach method of accumulation ratherthan Sennett’s madcap speed, can serve as perfect models of how to construct a gag, develop it, twist it, scramble it, then redevelop it, twist it again, and top it. 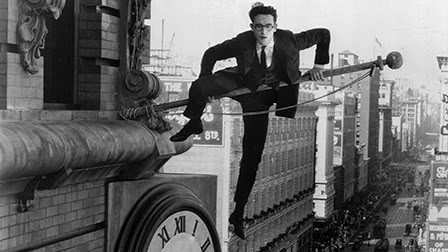 The most famous of these sequences is, of course, the climactic climb up a twelve story building in the movie’s finale, which is perhaps the best union of thrill and gag in Lloyd’s entire career. A large series of earlier events converge in the perfect formula to lead to this conclusion—a constant trait of Lloyd’s films is his careful arrangement of disparate pieces to lead to a whole, as if he is sewing tiny patches of material together which will only make sense when his character is faced with the entirety of the comedic cloth. 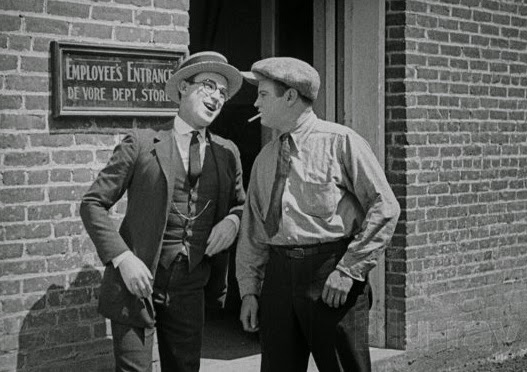 In an early scene, Harold wants to demonstrate to his friend his sway with the police. He had met a former neighbor and friend, now a policeman in the big city. In an effort to impress his friend, he tells him to shove the officer as Harold kneels down behind him to knock him down. Of course, the prank is played on the wrong cop, and Harold’s friend must run from the policeman, finally scaling a building to safety. Throughout the movie, Harold has managed to convince his sweetheart that he has become a rich man with a prestigious position. When she shows up to surprise him, he finds the perfect opportunity to turn his lies into truth. Overhearing a conversation between his boss and the general manager, who says he would offer anyone with an idea to draw more customers a thousand dollars, Harold thinks of his friend, the “human fly,” climbing the department store building and offers to split the money with him. The final sequence of the film, carefully constructed and brilliantly funny, is thus set up. In addition to getting himself into elevated trouble, Lloyd is turning a number of other screws. The character not only ends up climbing twelve stories, but is convinced, with each floor, that he will be relieved of climbing farther, hoping his friend will take over. Throughout the climb, he has to contend not only with the primary obstacle—gravity—but with other bits of comedic trouble as well. Children spill popcorn on his head; pigeons coo in his face and sit on his shoulders; a tennis net drops from a sporting goods department onto his head and shoulders; the scaffolding used by the building’s painters entangles his legs and body; “helpful” onlookers pop out of their windows to warn him he might fall and get hurt; his friend advises him to “make this next floor faster”; he gets attacked by a dog, whose owner then scolds him for endangering his pet; he opens the window of a photo studio where a model holds a gun in his direction, and, when the camera flash goes off, Harold thinks he is being shot at; he grabs a rope thrown to help him, which isn’t actually tied to anything at the other end; a mouse (!) runs up his trousers. The rhythmic, controlled cutting back and forth is extremely effective at setting up these gags and presenting the twists. 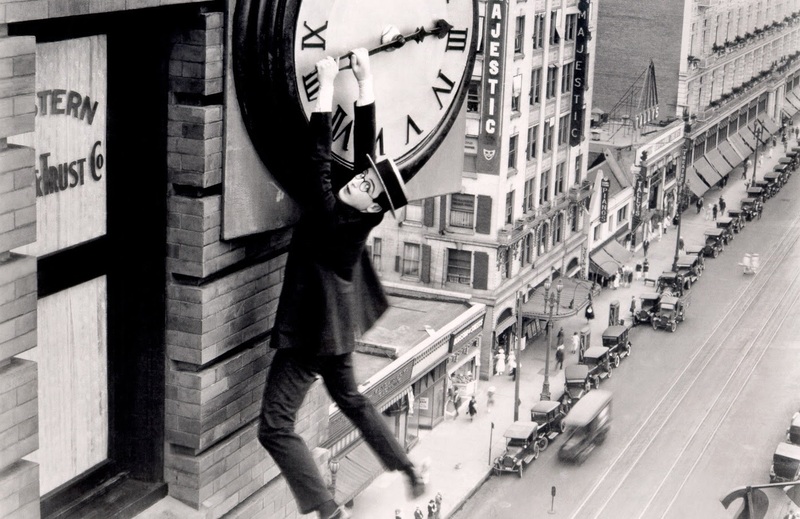 In the most famous shot of the film, perhaps of any silent comedy (a shot lovingly recreated in Martin Scorsese's Hugo), Lloyd grabs hold of the building’s clock. Its minute hand steadily deserts its safe position at nine (parallel to the ground) and slides back to six, leaving the character holding onto a metal finger than points in a most alarming direction. The whole face of the clock pops out, and Harold is left holding by a thread—or, rather, a spring. When he finally makes it to the top of the building, to apparent safety, he is greeted by a spinning anemometer. Crouching and not paying attention to what he’s doing, it takes a full two minutes for him to actually stand up and get smashed in the head, a wonderful example of comedic suspense. After getting hit, Harold walks dizzily on the ledge of the building, unable to take the one step to safety. Getting his foot caught in a rope, he is swung, upside-down, in a great arc above the street, and finally caught by his fiancée. Unlike tense melodrama, however, comic suspense never lets us forget the character will succeed—his near-miss, near-fatal stunts produce whooping laughter instead of actual audience anxiety. The sheer size of the building and the distance between the character and the ground—although the entire scene was shot above a protecting ledge, masterfully kept off-screen through the perfect camera angle—dwarf Harold’s presence, and make his accomplishments that much more impressive. It is obvious from the beginning of the sequence that he will not be able to switch with his friend. The character could not settle down for a modest reward and safety, having to risk everything for success. The fact that he succeeds, against all odds, epitomizes the appeal of Safety Last!, the glasses character, and Lloyd’s career in general. An important factor is that the fantastic stunts Harold goes through seem completely incongruous to his character; he is brave but shy, determined but misguided, energetic but not specifically gifted, physically or otherwise, in other words, an ordinary individual. When he achieves the goals he sets for himself, his accomplishment represents a victory for an audience made up of ordinary individuals as well.